Hi Friends! 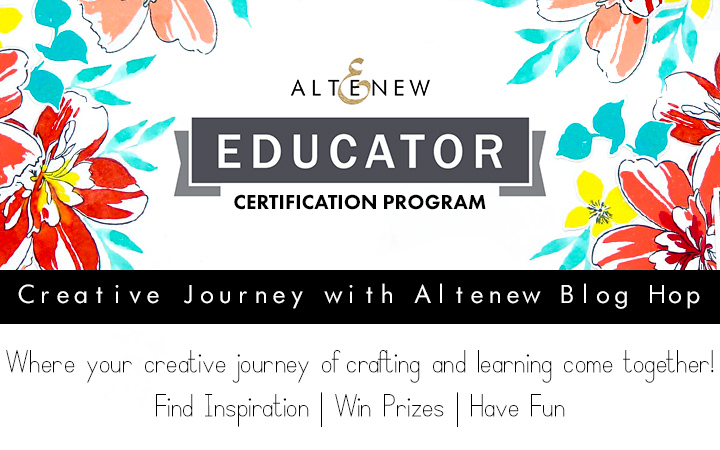 Welcome to the Altenew Educators Blog Hop! If you’ve been following along, you’ve just arrived from Kelli Cool's blog. If you find a broken link, you’ll find a master list of the hop links at the Altenew Card Blog as well as at the bottom of this post. As Altenew-Certificated Educators, we were asked to share our favorite techniques, style or Altenew supplies. I can’t pick only one particular stamp set or ink color or even technique, but certainly Altenew’s floral layering stamps are my absolute favorite of all time. Combine those with any of the gorgeous Altenew ink families and you have the main ingredients for a beautiful card. I have been an Altenew fan since I started cardmaking in mid-2015 so when Altenew started the AECP my decision to join was a no-brainer. I learned new techniques, but I also learned to use some of my standard techniques in a more efficient and precise way. I was able to glean something new from every instructor AND I did it at my own pace, on my own time, from wherever I wanted! Also the student galleries are loaded with inspiration. However, what I did NOT expect from the academy is that it would s-t-r-e-t-c-h my creative skills far beyond cardmaking! Because of the academy I challenged myself to learn how to create a YouTube channel, record a “how-to” video and a voice-over, even conduct a workshop. This new knowledge can be useful for different areas in my life. I started the program in January 2018 and I completed it in September 2018. If you are considering joining the program (just do it!) or are already on your way through, I wish you the best and most importantly- HAVE FUN! Click here to see all available classes at Altenew and to learn more about the certification program. Cut rectangular mask (I used the second largest frame from the Fine Frames Rectangles dies set) and place in center of white cardstock panel with removable adhesive (I used 80# Nenah Solar White for my panel and 110# for my base). I die cut the Fine Frames-Rectangles from gold cardstock and selected one to fit just inside my masked area. Glue the frame in place. The sentiment comes from the Oriental Orchid stamp set. Altenew is giving away a $30 Gift Certificate to THREE lucky winners! Please leave a comment on the Altenew Card Blog by January 23rd for a chance to win. Three winners will be announced on the Altenew blog on 1/25/2019. I appreciate your time in checking out this post, your next stop is the talented Terri Koszler. If you get a broken link you can start at the beginning, here is the list. Love your card, so bright! I love layered stamps too and your card is beautiful. This card is so colorful Michelle! Love it. Drop dead gorgeous creation, Michelle! I remember how you "grow" with each step of the challenge and rise above it! So proud of you! Thank you for joining the Altenew Educators Blog Hop today! fantastic card Michelle! love the colors you chose and especially the design - the fine gold frame sets everything beautifully! Wow! This is such a beautiful card. And I love how you used masking to get that perfect area for a sentiment. Thank you for sharing! Gorgeous layering! I also love how you masked the rectangle. Beautiful card - love the mix of colors - at first I thought it was water colored. I love that card. That is a great look, with the bold sentiment panel, then the lovely florals draping around it. So lovely! Love that beautiful background! It's nice to see that even educators grow with us that are learning! It's refreshing that you arent like I knew it all right from the start. And are more like yeah I had lots to learn and still learning! Love that and your card! Thank you for your comment, Krystal! The crafty world is definitely a learning process but I love that we do it at our own pace, in our own time. Beautiful card!! I love the design! I am with you...I am no colorer but own a whole lot of Altenew layering stamps..they are awesome! Oh my!! Your card is lovely. Your colors are gorgeous. The sentiment is perfect!! I love your card and the saying is wonderful! Beautiful card! Love the colors (great technique) and layout. Love the look of your card. The colors are amazing together. I just got into the Altenew layering stamps and dies. Love them all!! Love this card and the colors you chose are perfect! Thanks for sharing. Wow, Michelle this is gorgeous! Love the gold frame. These are just lovely! Thank you for sharing. Congratulations on qualifying as an Altenew Educator. Your card is lovely! Love your beautiful card! The colors are fantastic! Beautiful card. Great job on explaining how to of your card. Love the addition of foiled dots. Very clever. Thanks for sharing your art. Thanks so much Kaye! I truly enjoy sharing with others. Congrats on achieving your Altenew Educator certificate! What a striking card! I love the vibrant floral spray and you so perfectly balanced it with white space - so lovely. Such a vibrant and beautiful card!! Michelle this is so beautiful. I do think the layering sets from Altenew do line up really well. I love your choice of colors. They look amazing together. Thanks for sharing. My favorite technique is actually what you did on the last step! I love using my liquid glue and foil to add little dots of shimmer around my stamped flower arrangements. What a gorgeous card design and lovely colors!!! Michelle what a fabulous card. Congrats on completing the certification program. Your hard work definitely shows in your designs. Great job. Cool card. I totally agree with your description of us non-artists not understanding shadows & free coloring. You were able to put into words why I like the layering stamps! Stunning design! Love your card and your creative tips with the liquid glue dots. I love the oranges you used you don't see those colors used much, I love how vibrant the card is. Your card is so exquisite and vibrant, Michelle. I love the colors and your design. This is such a happy card, Michelle. I love the colors! And I really love the glue/foil idea. Beautiful flowers & the gold touches are the perfect touch! I've never seen anyone use glue to make spatters. What a cool trick! Your card is very pretty. I like the gold frame in the middle. I only have a couple of Altenew layering sets but I do like the fact that it adds depth to the images. Love the gorgeous card, Michelle. The colours are stunning. And the glue splatters are brilliant. I have been following your work for AECP for a long time. In fact I referred to your Level 2 final project several times when I was working on mine. Nandini, you are always so encouraging. Thank you for your kind comments and I am honored you could use anything I shared through my AECP experience. Lovely card! Thanks for sharing. The foil dots add a cohesive finishing touch to your piece. So pretty- the layered look you’ve done is really beautiful. Love your use of color, it looks so realist. Thank you for inspiring me to use not water color . I 💕 the colors.... very nice!! The frame absolutely makes the card. The details are magnificent, and it all comes together so wonderfully. Thanks for sharing. Love the colors great job! Brilliant colors with lots of white space - stunning! Absolutely beautiful. I love the color combo. I love your bold and beautiful colors used on one of my favorite stamp sets! Great card! Love the layering technique...I like the font on sentiment as well.Thank you for sharing! Wow...you are definitely a puzzle master. That card is beautiful!!!! Thank you for sharing. Love the idea of applying foil over the sticky glue dots. Very pretty card. Thank you. Beautiful card. I agree with you on the layered stamp sets, of course it takes me lots of tries to get colors that look right for the layers. . . Learning process!! Exactly! Thank you for your kind words. Beautiful card. Love the stamp and the coloring. Thanks for sharing. Beautiful! Love the colors and arrangement of flowers - and the foiled dots are nice finishing touch. I am just beginning with layered stamps - lining them up has been a challenge, but I love the look when they come out right. Love the addition of the gold square. Had to look twice before I figured how you did it. Smart. Enjoy your new adventure. Talented. Very pretty card. I too am a fan of layering stamp sets....I love the Altenew sets.....so pretty....and versatile. Thank you so much for sharing your card. love the oriental orchid stamp set and the idea of masking off you did for the center sentiment. I hadn't thought of that. Oh, so very pretty. Love the elegant touch of gold. Well done, too - on getting ACE status, brilliant! Wow! You did a great job on your card. Thank you for teaching us how to TRY! Congratulations on your achievement, you demonstrated your capabilities with this post! Oh Michelle, this is really beautiful. 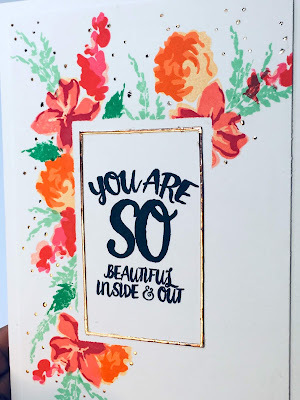 I am with you, Altenew's layering floral stamps are my absolute faves too! The colors here are so bright and warm! I love the little window cutout too! Great idea! Gorgeous card! I love the colors you used on these lovely flowers! Lovely card! I like the swoop of the design and the way your spray of flowers draws the eye across your card. Beautiful stamps and color choices! Your card makes me so happy! I put the Life is Awesome stamp set on my wish list. When you first look at it it is a little confusing but when you look at the chart it makes sense! Just lovely! Love the bright colors you used on your card. Thanks for sharing. So pretty with these cheery colors and I like the framed sentiment. What a beautiful card! I love the bold, bright colors....perfect viewing for this dreary weather! I, too, am in love with Altenew's layering stamps. I own so many, and need to get them out more often. Thanks for your inspiration here today! Love the bright and bold colours and your attention to detail on all of the layered flowers with the beautiful sentiment taking pride of place. Thanks for sharing. such a clean looking card with bold colors! Brava! Your stamping is great! Love how you paired florals with bold sentiment. Thank you Irina! Your project was lovely, I am so glad we are part of this team. Thank you for sharing this gorgeous card, Michelle! What a wonderful use of color. I can attest to your teaching talent. I took your class for the final part of your accreditation. It was fun and I received so many compliments from the card we made. Congratulations on your future with Altenew. Sandy, thank you so much for your support! Houston Junkies are awesome!! Hugs to you. Thanks for your encouragement to try some classes and learn how to improve our skills. Your card is lovely! Beautiful card. I love the watercolor look and the colors are gorgeous. Congrats on becoming an AN educator Michelle. Love your card with the bold blooms against the big sentiment and gold frame, the texture you added is a fantastic touch. Thanks for the inspiration! Congratulations! Thanks for sharing your journey too! You r card is striking with your colorful flowers and choice of stamps used for the words in black. Thanks for the inspiration and for the opportunity to win! luv hearing how the program moved you even further in your learning! I am SO intimidated by the whole video thing. congrats! Awwweeee! This is so beautiful and love the delicious layers! Great to hear all the positive endorsements about Altenew's program! This sounds wonderful to try!! Am really enjoying this blog hop! I love this card. I love floral cards. This is such a vibrant card. Thank you for sharing. Congrats on being an Altenew educator! Beautiful projects, I love your beautiful spray of flowers and the masked & gold framed sentiment placement! What a pretty card, and I love this sentiment. So sweet! Congrats on being a certified educator! You have made a beautiful card. Love your flowers they are really stunning! Rally fantastic card. I love what you've done, gorgeous!